Hurricane Irma has weakened to a Category 4 storm Friday as it batters the Caribbean on a path toward Florida but remains a powerful Category 4 hurricane. Guests staying at the Vinoy Resort & Golf Club are preparing to evacuate as the hotel is closing most of its facilities on Friday until further notice. Because the downtown bayfront hotel is under a mandatory evacuation, the Vinoy’s Snell Isle golf course, restaurants, pool, ballroom and pro shop, as well as the resort’s main pool and Alresco’s restaurant and health club have closed. No room reservations are being accepted for Friday evening and all guests are preparing to evacuate, according to an email sent to club members and guests. The Vinoy’s marina and tennis courts are also closed until further notice as of Friday. All access to the marina will be closed by noon Friday. Any vehicles left in the Vinoy parking garages after Friday morning will be towed at the owner’s expense, the email read. 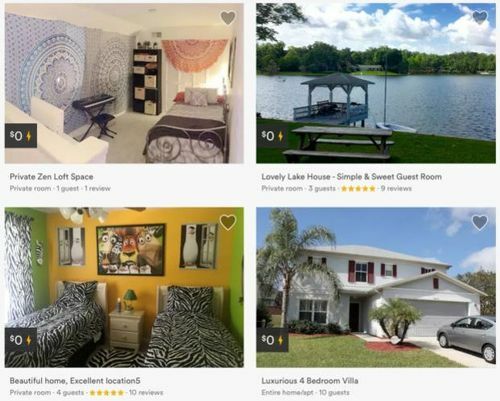 Tampa Bay TimesAirbnb is using its online vacation rental marketplace to connect those with a safe space to offer to those in need of temporary shelter during Hurricane Irma. 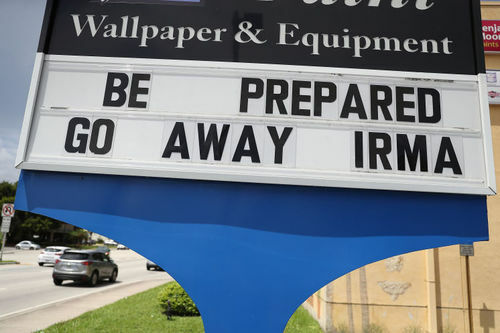 Time is running out to flee Irma. Here's the traffic situation across Florida. 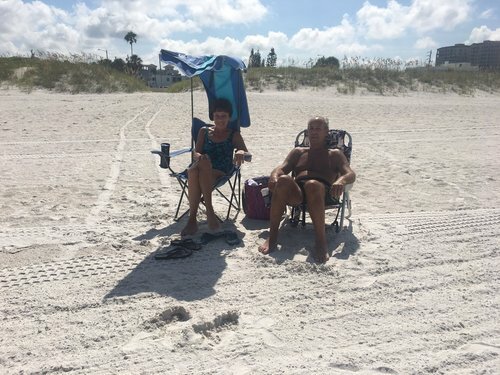 Tampa Bay TimesThousands are fleeing north to escape the hurricane’s wrath. 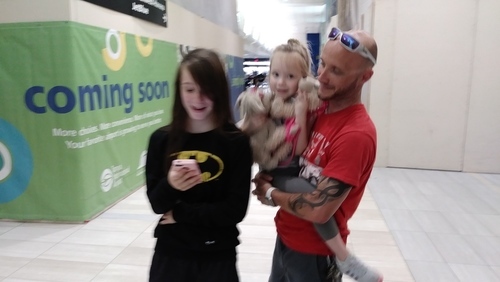 After missing his 10 a.m. flight to Alabama, Daryl Burgess, 37, waited with his daughters, 13-year-old Alysa and 4-year-old Coco Brown, in front of the Southwest ticket counter. Daryl Burgess with daughters Alysa and Coco Brown. "Traffic here was so bad we couldn't make it any sooner," Burgess said. Having lived most of his life in Florida, Burgess said he didn't want to take chances with Hurricane Irma and hoped to fly to Montgomery. But the ticket counter told his wife, Jenn Brown, there were no more available seats on any flights. "I guess we are going to go home and pray it's not so bad here," Jenn Brown, who lives in Hernando, said. "Maybe we can rent a car and drive north," he husband said. Brown said they had friends who drove out last night, but is worried about getting stuck on the interstate. 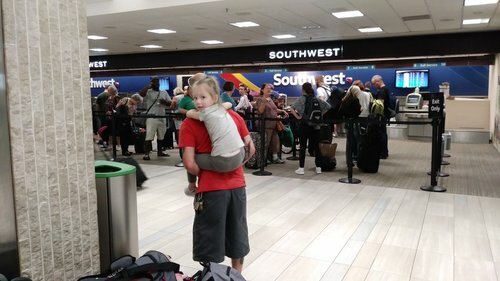 Still weighing options, the family picked up their bags and daughter's carseat and left the airport. 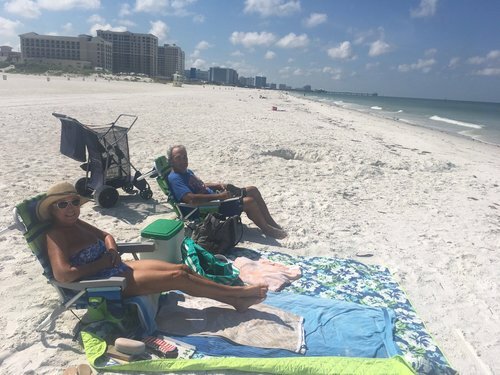 Tampa Bay TimesWhenever words like "catastrophic" and "apocalyptic" spew globally in tandem with "Florida" from the mouths of 24-hour TV anchors and meteorologists, concerns spike over the future impact on the Sunshine State. SeaWorld Orlando and Busch Gardens in Tampa Bay are planning to close by 5 p.m. Saturday, and will be closed on Sunday and Monday, Sept. 11. Aquatica Orlando and Adventure Island will be closed Saturday through Monday. Discovery Cove will be closed on Sunday and Monday. The Epicurean Hotel, a hip boutique hotel in South Tampa with 137 rooms is sold out for the weekend said Joe Collier with Mainsail Lodging, the hotel’s parent company. Colliers said hotel staff is hunkering down and preparing to ride out the storm through the weekend and into next week. With hundreds of parking meters and timed spaces in St. Petersburg, the city suspended parking enforcement — not issuing citations — at 5 p.m. Thursday. The suspension will last until the storm passes or until further notice, mayoral spokesman Ben Kirby says. By closing time Thursday evening, the Palm Pavilion on Clearwater Beach locked its doors and sent employees home with armfuls of food from the kitchen. 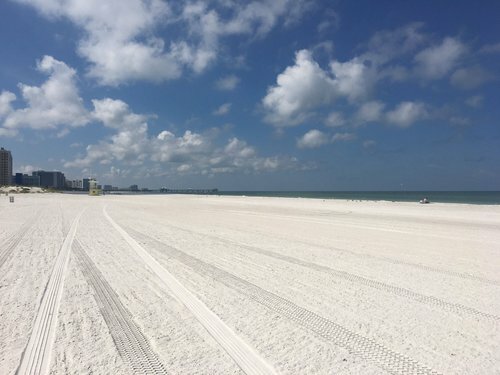 Clearwater Police are allowing beach employees over the Memorial Causeway Bridge during evacuations, but because customers would not be given access, owner Hoyt Hamilton decided to close the restaurant for the weekend. "It's like my dad always said. 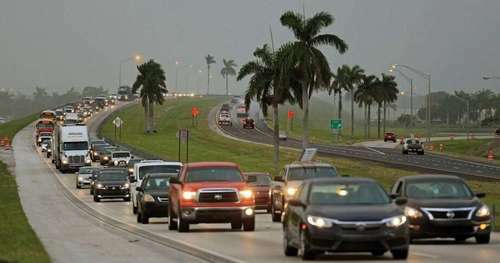 When we lose business to weather, there not a darn thing you can do about it," said Hamilton, also Clearwater Vice Mayor. The Pavilion is a 92-year-old wooden structure that sits right on the sand at an access to the public beach. It has hurricane proof windows and slats in the wood floors that have seen water rise up through it before. "That old girl has been through a lot in 92 years," Hamilton said. "This isn't our first rodeo." 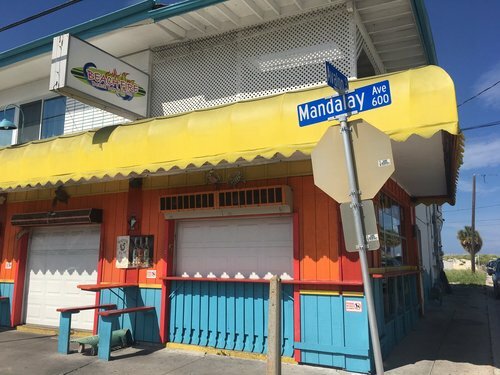 Hamilton said many beach businesses are following suit and shutting doors by Friday morning because of the limited access to the beach for the public beginning at 10 a.m. He hopes to open by Tuesday, depending on Hurricane Irma's wrath. 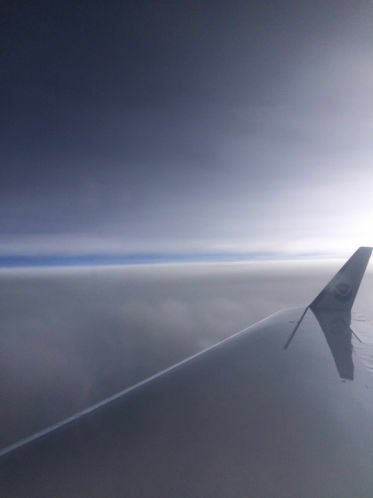 It's 5:40 a.m. Friday and the NOAA Gulfstream G-IV research jet, nicknamed "Gonzo," is flying about 42,000 feet over the Caribbean. 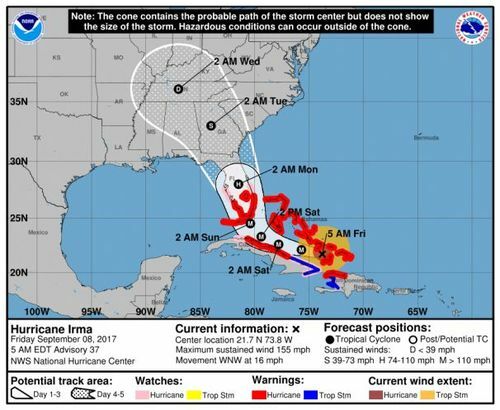 Portions of the Tampa Bay area are now under a hurricane watch, and Floridians remained focused Friday morning on just how soon Hurricane Irma would make the turn north that will dictate just how devastating one of the strongest storms ever to tear through the Atlantic will be on the peninsula. “It’s not a question of if Florida is going to be impacted; It’s a question of how bad Florida is going to be impacted,” Florida Emergency Management Agency administrator Brock Long said during a news conference Friday morning. Long said 8,000 government workers have been deployed: some working to stabilize the islands the once Category 5 hurricane already ripped through, others preparing to help Florida and the other southern states that could feel Irma’s wrath. Irma weakened to a Category 4 on Friday, but is still immensely powerful as it batters the Caribbean on its path closing in on Florida. A hurricane watch has been extended north along the west coast to the Anclote River, and on the east coasat to the Flagler/Volusia County Line. The latest projections put Irma making landfall in South Florida over the weekend. Long reminded Floridians that there’s still time to prepare, get supplies or evacuate. He expects power outages to last days — if not longer — across the state. The storm’s width is as big as all of Florida. “I can guarantee you no one in Florida has experienced what’s about to hit South Florida,” Long said. Hurricane Irma continues to be a strong Category 4 hurricane with winds at 150 mph. It is located 80 miles northeast of Lucrecia, Cuba, and about 450 miles southeast of Miami and is moving west-northwest at 14 mph. 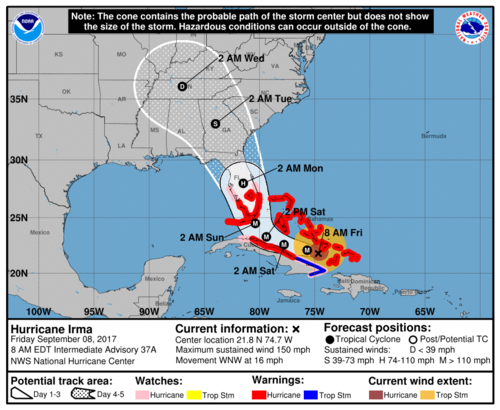 The core of Hurricane Irma is forecast to more between the central Bahamas and the north coast of Cuba today, and a turn toward the northwest is expected by late Saturday. It is forecast to be near the Florida Keys by Sunday morning. Hurricane-force winds extend outward up to 70 miles from the center and tropical storm-force winds up to 185 miles from the center. 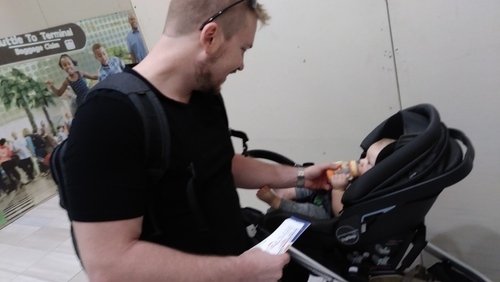 Nick Reese is taking his family to Washington, D.C.
Nick Reese, 31, said if Irma had come just a few years earlier, he might have tried to weather the Category 5 storm. "It's funny how having a child changes your perspective," Reese said. Instead of going to the gym Tuesday, Nick and his wife, Yardena Reese, 31, bought plywood to board up their home. 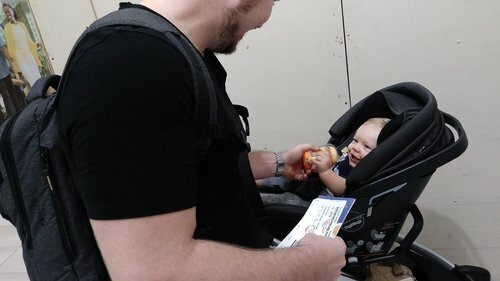 But that same day, they decided to give their supplies to friends and buy a ticket to Washington, D.C.
"I grew up here, and I haven't seen people act this nervous over a hurricane," Nick Reese said, while feeding their 1-year-old "J." Originally from Spain, Yardena said she had never seen this kind of excitement over an impending storm in her country of birth. "It's just like the movies," she said.